The E-Props propellers are designed, manufactured and tested to meet the requirements of the aeronautical standards. Quality and safety are ongoing concerns for the E-PROPS company, throughout the design, procurement, manufacturing, testing and marketing of all its products. The certification of an aeronautical equipment is a process which allows to make sure of the reproducibility and the follow-up quality of this product, from the design phase through the use on a plane. It is an excellent principle in aeronautics, domain where an error or a negligence could have dramatic consequences. 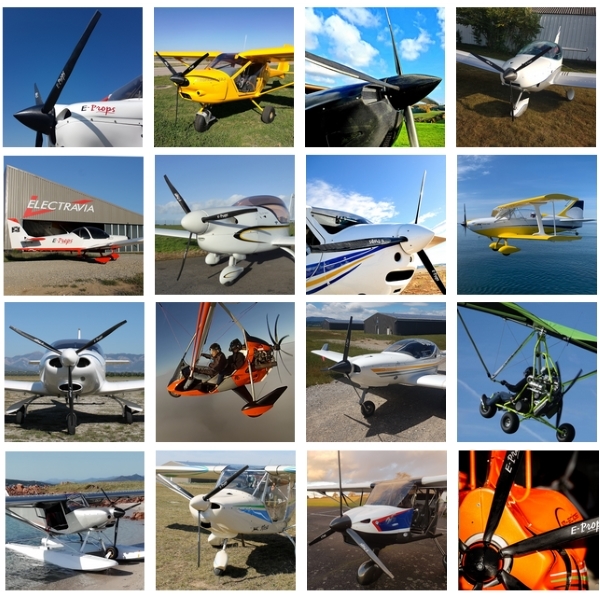 Except ultralights or homebuilt aircraft, the other aircraft are certified and must follow strict standards. The propellers which equip the certified planes must themselves be certified. Today, the obtaining of an aeronautical certification is a complex, long and expensive process. It is not only a question of certifying the production of the manufacturer, but also its method of design of products, assembly line then product itself, and finally adaptation of the product to a defined aircraft. The process of certification contains several phases and lasts several years. After the certification and the start of a product, the certification agency assures throughout the useful life of the product its responsibility of the surveillance of the initial airworthiness. Besides, a certified product can undergo repairs and modifications, themselves that must be in accordance with the regulations of airworthiness and approved by the competent authority. In 2018, E-PROPS has started the works to certify the company and its products following the EASA standards. E-PROPS meets the ASTM F2506-13 standards, for the Light Sport Aircraft. It is a first step before the certification following EASA standards. 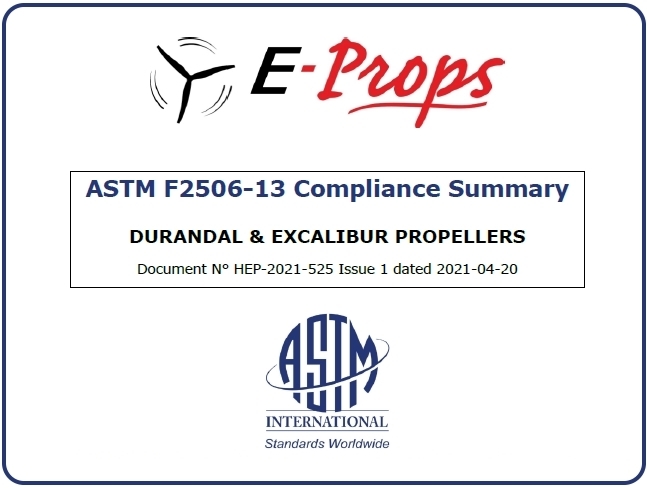 The ASTM F2506-13 specification covers the establishment of the minimum requirements for the design, testing, and quality assurance of fixed-pitch or ground adjustable propellers for light sport aircraft. The propeller may not have design features that have been shown to be hazardous or unreliable unless the suitability of each questionable design detail or part can be established by tests. Strength testing, stress measurement, fatigue strength, and fatigue analysis, endurance testing, and teardown inspection shall be performed to meet the requirements prescribed. Quality and security are ongoing concerns for E-PROPS all along of design, purchases, fabrication, tests and marketing of its products. E-PROPS has established a Quality Charter (a Quality Charter is a short text that summarizes the quality commitments made by the company). 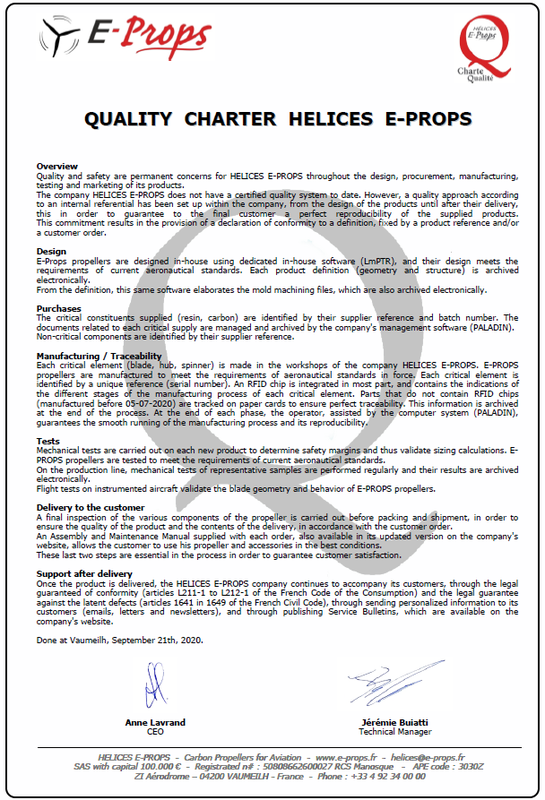 The Service Bulletins are published by the manufacturers of aeronautical products. They are established to prevent the users of a technical problem, a novelty or an improvement of an aeronautical product, as well as to transmit a technical information concerning the use of an aeronautical product. E-PROPS has chosen the complete transparency towards the users of its products. The improvements, modifications and changes brought to its products further to tests, feedbacks and possible problems met by the users are detailed in Service Bulletins written by the company. It is not an obligation, but a security approach in the sector of the leisure aviation. Some manufacturers of aeronautical products made for ultralight aircraft (not certified) do not bother writing such Service Bulletins. Unlike those companies, E-PROPS has chosen to be transparent and publishes here its Service Bulletins. The E-PROPS teams recommends to the users to chose suppliers who present their Service Bulletins to prevent their customers. Incomplete review of all information in this document can cause errors. Please read the entire Service Bulletins to make sure you have a complete understanding of the requirements.